Our customers are our most valued assets. We are pleased to share a few of our customer's accolades with you. We built our new building back in 1987 when we moved from the airways location. We have used our showroom as a warehouse style showroom. Equipment is unloaded off trucks and dragged into the showroom along with grease from the trailer truck floors causing deep scars and grease build up. 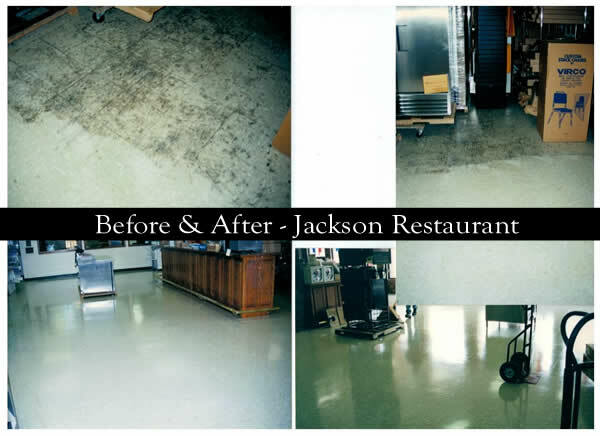 We had planed to replace the floor as it looked too damaged to clean up and wax. Thank you so much for the miracle you and your men performed on our floor! Your company is highly recommended and you are more than welcome to have your customers call. You have made us look good again! Since January 2012, Bob's Janitorial Services has been contracted to provide our company, Leroy Somer, with janitorial and housekeeping services. The owners, Mr. Bob Williams, his son Coree Williams, their supervisory staff and employees have supplies our company with excellent service. Their staff is dependable, consistent, efficient, self-reliant, and very thorough in their daily work. The working relationship that their staff maintains with our employees is always courteous and professional. Our facility is 490,000 square feet and employs approximately 750 employees with 5 shifts. There is little doubt that our manufacturing facility and employees are very demanding, however the janitorial staff does a spectacular job of taking care of our needs. Bob, Coree, and the supervisory staff, no matter what extra tasks are requested always seem to exceed our expectations. They are an asset to our business. There is no doubt to me, that our company made the right decision by contracting our janitorial needs to Bob's Janitorial Services. It has been an absolute pleasure working with Mr. Williams, Coree, and their staff. If you have any questions or perhaps I could be of further assistance, please feel free to call. I can personally recommend the above named cleaning service with high regards. They have been cleaning our office building for 3-1/2 years. They do an excellent job, dependable and they would be a great choice for your cleaning services. Feel free to contact me personally if you so desire.